This was found on a front porch in Anthem, Arizona (where I live, just North of Phoenix). They’re typically grey in this, or maybe a little bit of blue tint. This old guy looked purple. Really a pretty snake to see in person, and I was happy to relocate it so it can continue living. This entry was posted on Wednesday, January 18th, 2012 at 8:05 am	and is filed under Relocation & Rescue, Snakes. You can follow any responses to this entry through the RSS 2.0 feed. You can leave a response, or trackback from your own site. Wow! Tigers really do have small heads in proportion to their size! That they do! 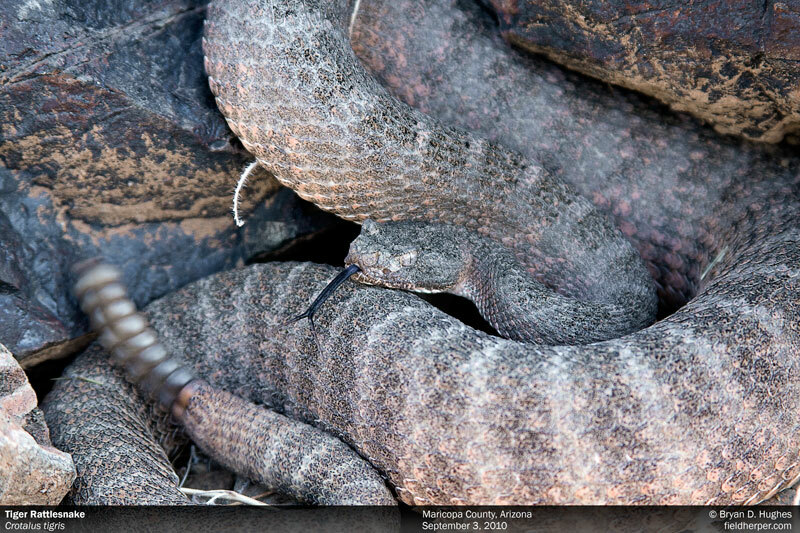 They look really funny when sitting right next to a speckled rattler of the same size. The head is about 50% of the size it should be. These smaller rattlesnakes have only recently been evaluated for venom toxicity. This one takes the top spot in toxicity for any land snake in the Western Hemisphere at an LD50 of 0.06 mgm/ kg for a mouse. This is about ten times the lethality of an equivalent amount of Coral snake venom. There is another small rattlesnake, the Grey Midget rattler, that is about as lethal as the Coral snake at 0.1 mg/kg for its mouse LD50. Of course, bear in mind that different tables may give different toxicities. I grabbed these as a worst case.